Click the "RUN FOR THE WALL" photo below to go to actual website ! To promote healing among ALL veterans and their families and friends, to call for an accounting of all Prisoners of War and those Missing in Action (POW/MIA), to honor the memory of those Killed in Action (KIA) from all wars, and to support our military personnel all over the world. We strive to maintain a safe, supportive and private atmosphere in which all participants can reflect and heal on their journey to the Vietnam Memorial in Washington, D.C. in the hope that they can return home to a new beginning. To guide the participants across America.To educate future generations as to the importance of accountability in wartime actions emphasizing that no one should be left behind. Run For The Wall (RFTW) was started in 1989 as an effort by James Gregory and Bill Evans. They were a couple of Vietnam Veterans who traveled across the heartland of America on motorcycles, talking to local radio, TV, and newspapers about the fact that we had thousands of men and women still unaccounted for from all of our wars. The need for this awareness continues today and we continue this tradition every May. We don't give political speeches or stage demonstrations. Run For The Wall gets its message to the pulic across by riding through the United States. We obey traffic laws and treat all citizens with dignity and respect. But the issue of public awareness is only part of the benefit of Run For The Wall. We also give Vietnam Veterans and all Veterans the opportunity to get their own welcome home and start their healing process. Everyone who has fought or has friends or loved ones who have fought in a war has their own issues from their experience. Everyone has issues -- the welcome home, the good-bye to buddies lost, the ability to finally help the young men and women we watch every night on TV, or just trying to accept coming home alive. Many who participate in Run For The Wall find that whatever they've been missing, can be found in the Run For The Wall family. They can finally start settling issues that have been put away for over twenty years. There is a nominal charge for participating in Run For The Wall, and you have to pay your own expenses. We have been very fortunate in the past in that we generally get a great deal of support from organizations and people along the way. Most evening dinners are provided free or for a small donation by concerned citizens, many breakfasts and lunches are provided, also. We have generous groups who have paid for gas and lodging on occasion. The trip takes ten days to reach the Vietnam Veterans Memorial, where our Run officially ends on Sunday evening before Memorial Day. 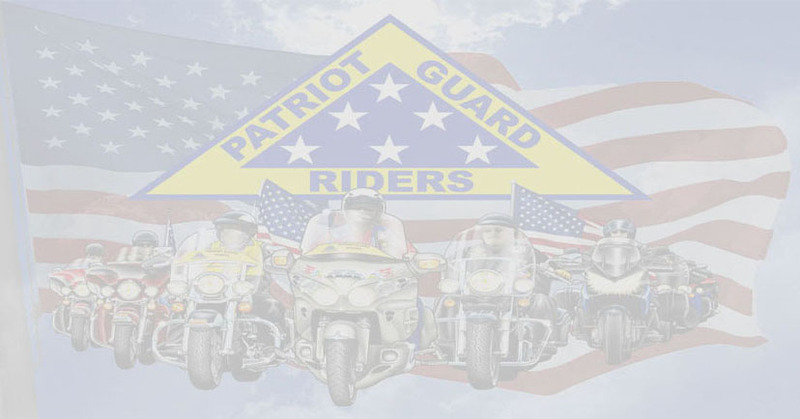 Additionally, we have things scheduled for the weekend, ending with participation in the Rolling Thunder Parade in Washington, D.C., on Sunday. It is quite a sight to behold, 500,000 plus motorcycles all starting from the Pentagon parking lots, parading through downtown Washington, and ending at the Wall. Along the way across the U.S. we make stops at Memorials, Veteran's Hospitals, and schools. We enjoy parades, escorts, and welcome-home receptions from many of the patriotic towns. The ages of the participants range from eight to eighty. These include: mothers, fathers, grandfathers, and grandmothers (some of whom ride their own bikes! ): veterans from World War II, Korea, Vietnam, Desert Storm, Iraq Freedom and Afghanistan: active military, supporters, friends and family. Everyone is welcome. The main rule is NO ATTITUDES. Some people join Run For The Wall and think of it as just another vacation or motorcycle event. After one or two days, though, you realize this is something very special. It is unlike anything else you have experienced, and it becomes a MISSION! You become part of the Run For The Wall family whose members come from all over the United States, Canada, Australia and other countries. What could be more perfect than, riding on a mission, making new friends, and helping a very good cause, POW/MIA? You don't have to ride a motorcycle to participate. By joining or supporting Run For The Wall, you participate in our mission of: promoting healing among ALL veterans and their families and friends: calling for an accounting of all Prisoners of War and those Missing in Action (POW/MIA): and honoring the memory of those Killed in Action (KIA) from ALL wars. The important thing is to join the cause! Click n go back to top!